Perfect for your patio, café or any canteen environment. These durable thermoplastic coated round café tables and chairs will be a long lasting investment. Stay comfortable under the shade by adding an optional colorful umbrella to match your outdoor setting. 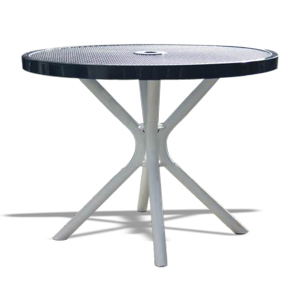 Table measures 31" in height and comes standard with a 2" umbrella hole. Stacking chairs measure 21"W x 33"H x 26"D with an 18" seat height. 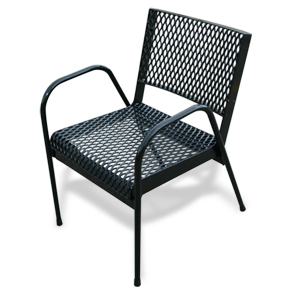 Table top and chair seat is available in your choice of two highly durable, weather resistant the matte Polyethylene finish that has a painted feel with a slight texture. 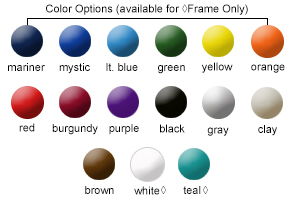 Frames are powder-coated so you can mix and match from a variety of vibrant color options shown below. Tables and chairs sold separately. Expanded Steel Table Top, Seat & Back. 7/8" Aluminum Powder-Coated Seat Frame. 2" O.D. Powder-Coated Table Legs.